Chapter on Quantified Self and older adults, I used my mom as a case study. Readers of this chapter are taken through a journey by the author, who narrates a real-life story of a lady called Maria who is 75-year old and lives with her husband Albert, 81-years. The narration describes the lives of Maria and Albert, detailing their enjoyment of physical activity, and their children. Yet, one-day Maria is diagnosed with Alzheimer’s and through the narration the author describes the experience that Maria and her family experience. Fast forwarding, to the year 2030, the author continues her narration describing how technology may fit into Maria’s life and that of her family; including the use of wearable devices and sensors integrated into the home where Maria lives, and enabling her family to track in real-time Maria’s sleep patterns and overall health. Additionally, this chapter discusses the fields of ageing in place, the quantified self (QS), and based on existing work in this field, the author explores a taxonomy for the QS, referencing and drawing on the work of Deborah Lupton. 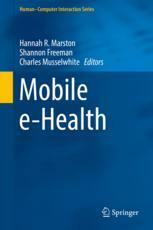 Further exploration and discussion in the areas of appropriation, affordance, rights, and risks of QS are provided with the author exploring how digital technologies fit within the healthcare system. In recent years we see a growth in the use of Personal Informatics (also known or referred to as Quantified Self, lifelogging). Where people track specific elements of their lives, they gather data and analyze data. Most of these digital technologies have the aim to create awareness and behavior change. Positioning these digital technologies towards preventive healthcare and e-health in general. To deliver the promise of Personal Informatics in healthcare, these digital technologies will need to comply to different aspects as ‘The practices, meanings, discourses and technologies associated with self-tracking are inherently and inevitably the product of a broader social, cultural and political process’ (Lupton, 2014). In addition, the design and development of these devices need to trigger positive engagement with the user. Can we rethink data visualizations, create more meaning and context within the realm of these digital technologies? In this paper we would like to explore the combination or integration of socio-political aspects in a product design cycle of these digital technologies based on Value Sensitive Design. Sleeping with Cognitive Capitalism – my talk at Leeds Beckett University on July 4th. Today data is surrounding us almost everywhere. We as users of different applications and devices feed the data machine. We track ourselves with devices and mobile apps, we produce news feeds about ourselves on numerous platforms, we are data, we are content. As we create detailed digital profiles of ourselves we should think about what is happening with all this data. Is this data exploited, sold to data brokers, advertisers or is it used a s research material? Or is it just passive around us? A whole new economy is rising out of our detailed digital profiles. Not only in the advertisement space, where this data is used to target us even more within our supposed field of interest, but also in our health space and workspace this data can be used for the better or worse. Ethics and privacy are elements that we need to consider more clearly. By considering aspects of ethics and privacy, can we lay a responsibility with the companies who produce and develop these devices and apps? Do we need to think about a new label especially for devices and apps targeted at the domains of health and workplaces that regulates and stipulates the conditions for development and design. A set of criteria to what these devices and apps have to comply? If we want to create trust within this environment for a wider adoption, it might be time to create more transparency in data ownership and the design and development of a new generation of products and services. Digital Health Digital Capital, you can register here. Engagement with wearables or mobile app? Recently there has been some movement in the market of wearable devices. While this market had a fast growth, today there are some players who switch gears. Nike Fuel armband most probably will be discontinued over the next months. LarkLife was discontinued after a few months of its existence. Fitbit Force had a recall in the marktet because of rash induction. Rumors say that activity trackers will be more and more implemented in the smartphones. As wearable activity trackers are hard, usually they don’t have a screen where you can see your results immediately, there is always the synchronisation that has to take place. And apart from that, practise shows that after a 6 month period or earlier, the tracking devices are going into a drawer somewhere unused. I have some in mine as well. I still use Runkeeper for my physical activity and BodyMedia for my sleep and activity tracking. Even though my data is more or less the same all the time, I just like to have that data now, it is an extra confirmation. Using Runkeeper as an extra app on the iPhone is mainly because of the data has a different presentation and there is also the availability of music that motivates me to run and do Tai Chi during my excercise. In addition I use Lift to keep track of my frequency on the excersise habit. I like Lift as a frequency tracker to see the difference in seasons and time availability. Something I need to pay attention to. So I tend towards mobile apps as well, although mobile apps can’t solve everything. In different areas we will still need wearables too, but maybe in different ways. All in all if I reflect on my change in lifestyle I started in October 2012, the technology use was one aspect and made me curious on my results, but more importantly it is that 30 minutes in nature, in the calm, that makes me feel my day starts differently and I feel more happy during that day, that makes me continue doing this. The feel good aspects about doing the activity is the major trigger in continuing this! Technology is just a small aspect in the whole picture, to make it more complete. I found the perfect spot to practise the activity, it is easy and accessible. And it fits in my planning (time availability) or I make it fit in my planning 🙂 . I think this never happened before! When I woke up I did’t had the feeling that my sleepscore would be so high, although I felt I fell in a coma from the moment my head hit the pillow last night. I was really relaxed yesterday, especially in the evening. First I went to the hairdresser, and the guy who washes your hair, is really good in head massages, it is a real pleasure to feel his hands on your head, really smooth, no words for it really. After that went to the market to buy some good food, and then had a complete body massage. Getting rid off all the stress that I had in June and July and went home. Cooked watch some tele and went to bed around 11.00. I guess it was a nice day and spoiled my brain and body. Resulting in a 97 % sleep effeciency, just awesome!